"I wanted to express my thanks to you for our beautiful wedding flowers for our wedding back in September and wanted to share some of the pictures from our special day with you. The yellow flowers in the bouquets and the centerpieces really brightened up the room and I couldn't have asked for anything more beautiful. We received a lot of compliments on how beautiful everything looked. Hope all is well and thank you again so much! " 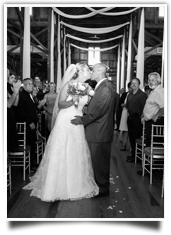 "Angelina was my florist for my wedding at Old Bethpage Village Restoration on 6/22/13 and she was an absolute pleasure to work with. From start to finish she was a professional and extremely responsive to any and all questions and ideas. My situation was a little bit unique because my mother wanted to make all the table centerpieces and then Angelina would make all the bouquets, corsages, and boutonnieres as well as a flower arch for the altar. She worked really well together with my mother and made sure my mom had everything she needed to design the centerpieces. She also had a beautiful vision for my venue in particular by hanging gorgeous white drapes from the beams in the high ceilings that really made the space stunning. I would wholeheartedly recommend her to anyone :)"
"I used Angelina's Floral Design for my recent wedding and she did an outstanding job. I personally think everyone should use her for their floral needs. Her attention to detail and professionalism were incredible. She literally took my vision and turned it into an even better reality. I will definitely be recommending this company to everyone I know who needs flowers for any occasion. I can't thank Angela enough!" 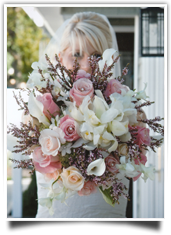 "Angelina's Floral Design met all my expectations and more for my September 2008 wedding. I was blown away with the detail & time that was put into my candelabra centerpieces & bouquet. The flowers were so fresh & lasted well beyond my wedding date. I have used Angelina's Floral Design for both of my son's baptism's as well and I was just as impressed as I was for my wedding. I have not seen any other florist do the articulate type of pieces & bouquets that she does. 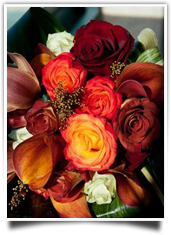 Whatever type of affair you may need floral arrangements for, she can make it happen, beautifully!" 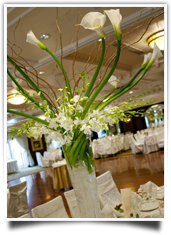 "I hired Angela to do the floral arrangements for an affair where there were 400 attendees and 35 tables. Her work was outstanding!! Her creativity and meticulous attention to detail set the tone for the affair. The venue was a barn, which required just the right eye and attention to transform it from the ordinary to the extraordinary. The compliments from those attending were endless!! Even the caterer's manager, who has seen numerous and far more elaborate affairs, complemented her work and initiative in solving an unforeseen eyesore (she took the initiative to mask the problem....and thank goodness she did!) Angela is a pleasure to work with and I can wholeheartedly recommend her. 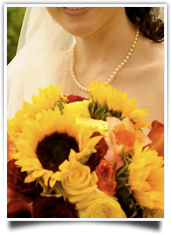 September 15, 2011"
"We used Angelina's Floral Design for our summer wedding and the flowers were absolutely gorgeous. My bouquet was stunning and the centerpieces were beautiful as well. I really enjoyed working with Angela for many reasons. She was very easy to work with (which I especially appreciated because I was planning the wedding long distance and we actually never met in person! We did everything over the phone and email) and responded to all my questions and concerns in a timely manner. I didn't really know what I wanted, and it was great to get her ideas. I gave her a few of my ideas, and from that she made some suggestions that were spot-on. She also made absolutely sure I was getting exactly what I wanted, and she worked within our budget as well, which was very much appreciated (and never made me feel like I couldn't have something because of that budget). I didn't feel constrained at all. Overall I would highly recommend Angelina's Floral Design!" 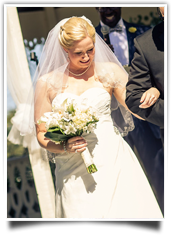 "Angelina's Floral Design was absolutely perfect for our wedding on November 5, 2011. Our flowers were full of beautiful fall colors that popped in all of our photographs. They looked amazingly beautiful on our tables and decorating the gazebo which we were married under. The arrangements all looked perfect, fresh, and each were clearly created with lots of care and creativity. Our table arrangements included beautiful vases and candles to accent and create a romantic ambiance. Angelina's Floral Design made the wedding planning process so much easier. Angela listened to all of my ideas and desires as well as introducing me to new ones. She is very attentive and puts her all into her work. I could sense this immediately during our first meeting. I knew she was the perfect florist for our wedding! We were overly happy with our choice and results. 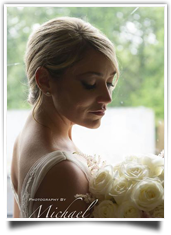 If you want extra special, individualized attention, as a bride in the overwhelming wedding planning process, then Angelina's Floral Design is definitely the best choice!" 2019 Angelina's Floral. All rights reserved.